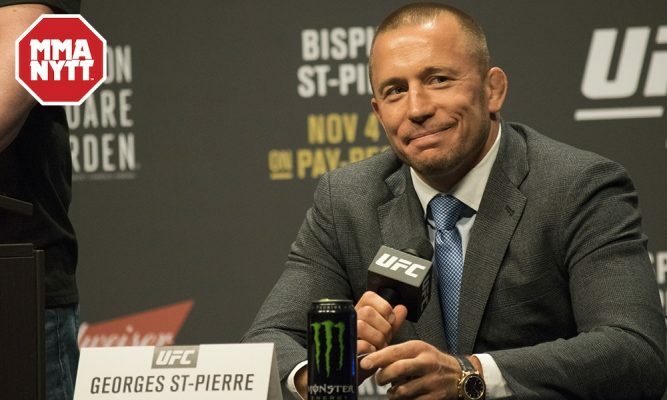 Georges St-Pierre is only interested in fights that will add something to his legacy but it might be difficult for him to compete for another UFC title. During a tour of Australia this week, St-Pierre said that he would be interested in facing the winner of the upcoming UFC 229 main event between lightweight champion Khabib Nurmagomedov and Conor McGregor. Not only would the fight serve as a massive payday for everybody involved but it would also give St-Pierre the chance to become the first ever three division champion in UFC history after already holding the middleweight and welterweight titles previously. Well UFC president Dana White doesn’t seem to like that idea whatsoever, especially considering how St-Pierre has relinquished the last two championships he’s won inside the Octagon. St-Pierre had a feeling that was going to White’s opinion when he heard about the potential matchup. When he first mentioned the possibility of fighting either Nurmagomedov or McGregor for the lightweight title, St-Pierre added that the UFC was obviously not happy after he won the middleweight championship last November in a fight against Michael Bisping and then ultimately surrendered the belt weeks later due to health issues. Back in 2013, St-Pierre also relinquished his welterweight title before taking a sabattical from the sport that lasted nearly four years. St-Pierre did say he would consider a ‘super fight’ against Nurmagomedov or McGregor without a title on the line but it’s tough to imagine the UFC going that route either. Then again, St-Pierre fighting either Nurmagomedov or McGregor would be a huge event where everybody involved would make a lot of money. So despite White’s trepidation about giving St-Pierre another title opportunity, it’s tough to imagine he wouldn’t at least consider the option after Nurmagomedov and McGregor finish their fight on Oct. 6.